Want to know what we are all about? Then hear it from our previous customers. 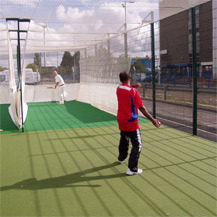 Below are a selection of case studies showing the variety of our multi use games areas and goal ends. We were thrilled to work in partnership with landscaping giant, Whiting Landscape on their latest redesign of Rugby Road Park in Hinckley. We were approached by Whiting Landscape to help them bring an element of sport and exercise into their project by designing, manufacturing and installing an exciting multi use games area. The students at Hilldene Primary School in Romford, Essex had a big surprise on their return from the summer holidays after we installed a brand new multi use games area. The students previously played on an old and uneven school yard which wasn’t ideal for sports. 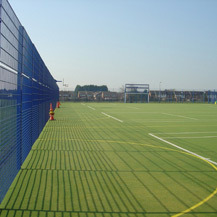 We designed a ball court suitable to the school’s needs and to the age of the players – all of which was manufactured and installed ready for the new school term. 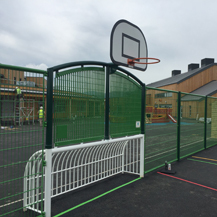 As one of the UK’s leading suppliers and installers of multi use games areas we specialise in sports such as football and basketball so when Basketball England asked us to work with them on a pilot project, we jumped at the chance. 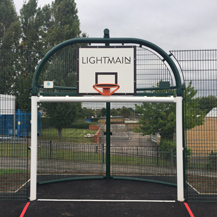 In this project Lightmain provided design guidance at the early stages for the refurbishment of an old tarmac formal sports area, which originally incorporated four tennis courts that had deteriorated and become unplayable. 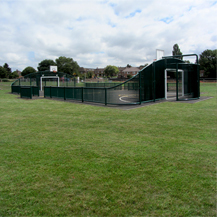 What better way to complete a new school project than having a brand new multi use games area for the students to enjoy. We were appointed by Read Construction to design, manufacture and install a 37m x 18m ball court as part of their large modernisation project of a primary school in Llandudno. Funded by Ford Motor Company, this project involved the design, supply and installation of a bespoke Multi Use Games Area with tennis court, football pitch and ECB approved cricket wicket training facilities onto an existing worn car park area. 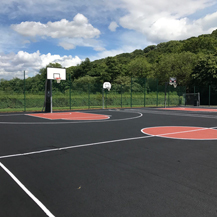 The installation for this multiple use recreation facility included the laying of tarmac, line markings and synthetic surfaces, as well as three bespoke lighting systems.